The scope of psychiatric nurses may be in general psychiatry care and specialised areas like child-adolescent mental health nursing, geriatric-psychiatric nursing, forensics, or substance-abuse. Linda Richards, the first psychiatric nurse graduated in the United States in 1882 from Boston City College. In 1913 Johns Hopkins University was the first college of nursing in the United States to offer psychiatric nursing as part of its general curriculum. The first psychiatric nursing textbook,Nursing Mental Diseases was authored by Harriet Bailey, in 1920. The registration of psychiatric nurses was done by 1920 in the UK and degree courses in psychiatric nursing began in the USA. Psychiatric nursing was included in the basic nursing curriculum by the International Council of Nurses in 1961. In 1963, President John F. Kennedy in United States passed the Community Mental Health Act which proposed the deinstitutionalization of mentally ill persons. For the first time in India, 11 British nurses along with one matron were brought from the UK to work in the mental hospital at Ranchi in the 1930s. Short training courses of three to six months were conducted in Ranchi in 1921, which were recognized by the Royal Medical Psychological Association. During 1948-50 four nurses were sent to the U.K.by Govt. of India for mental health nursing diploma. the Mental Hospital, Chennai (in lieu of midwifery). During 1954 Manzil Medical Health centre, Lucknow gave psychiatric nursing orientation course of 4 - 6weeks duration. Govt. of India decided to start training psychiatric nurses during 1953-54 and started the first organized course at All India Institute of Mental Health (presently NIMHANS). In 1964–1965, the Indian Nursing Council (INC) made it a requirement to integrate psychiatric nursing in the nursing diploma and degree courses. In 1967, a separate Psychiatric Nursing Committee was formed in the Trained Nurses Association of India. 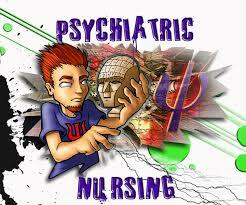 Diploma in Psychiatric Nursing is conducted in three institutions in India. Master of Psychiatric Nursing (MPN) programme is conducted in many institutions. Doctoral programme in psychiatric nursing (Ph.D.) at NIMHANS, Bangalore. Allow client opportunity to set own pace in working with problems. Nursing interventions should center on the client as a person, not on control of the symptoms. Symptoms are important, but not as important as the person having them. Recognize your own feelings toward clients and deal with them. Go to the client who needs help the most. Do not allow a situation to develop or continue in which a client becomes the focus of attention in a negative manner. If client behavior is bizarre, base your decision to intervene on whether the client is endangering self or others. Ask for help—do not try to be a hero when dealing with a client who is out of control! Avoid highly competitive activities, that is, having one winner and a room full of losers. Make frequent contact with clients—it lets them know they are worth your time and effort. Remember to assess the physical needs of your client. Have patience! Move at the client’s pace and ability. Suggesting, requesting, or asking works better than commanding. Therapeutic thinking is not thinking about or for, but with the client. Be honest so the client can rely on you. Make reality interesting enough that the client prefers it to his or her fantasy. Compliment, reassure, and model appropriate behavior. Psychiatric nursing uses theories of human behavior as its scientific framework and requires the use of the self as its art or expression in nursing practice. Providing leadership and clinical assistance for other nurses and health care workers. Reddemma K, Nagarajaiah. Psychiatric Nursing: The Perpetual Cinderella. In Mental Health: An Indian Perspective. Edited by S. P. Agarwal. Directorate General of Health Services Ministry of Health and Family Welfare New Delhi, 2004. Mosby's Medical Dictionary, 8th edition, 2009, Elsevier.